Garden centres are getting better at providing more variety when it comes to vegetable seedlings. Last year I found a surprisingly nice selection of hot peppers at a nursery in Owen Sound. Still, I prefer to grow vegetable varieties that have the characteristics that are most important to me; whether that’s days to maturity, colour or disease resistance. I’m a bit of a control freak that way. This year my priority is buying organically grown seed. I’m still using up seed from previous years, but most new seed I purchased this year had to be organic. One exception was a package of blight resistant tomatoes – ’cause who knows when blight is going to strike and wipe out your entire crop. Better safe than sorry. The first seeds to be started around here are peppers. I’m still amazed that this little tiny dry speck grows into a lush tropical plant that provides food for us. This is only my second year to grow pepper plants from seed, so I have a lot to learn. 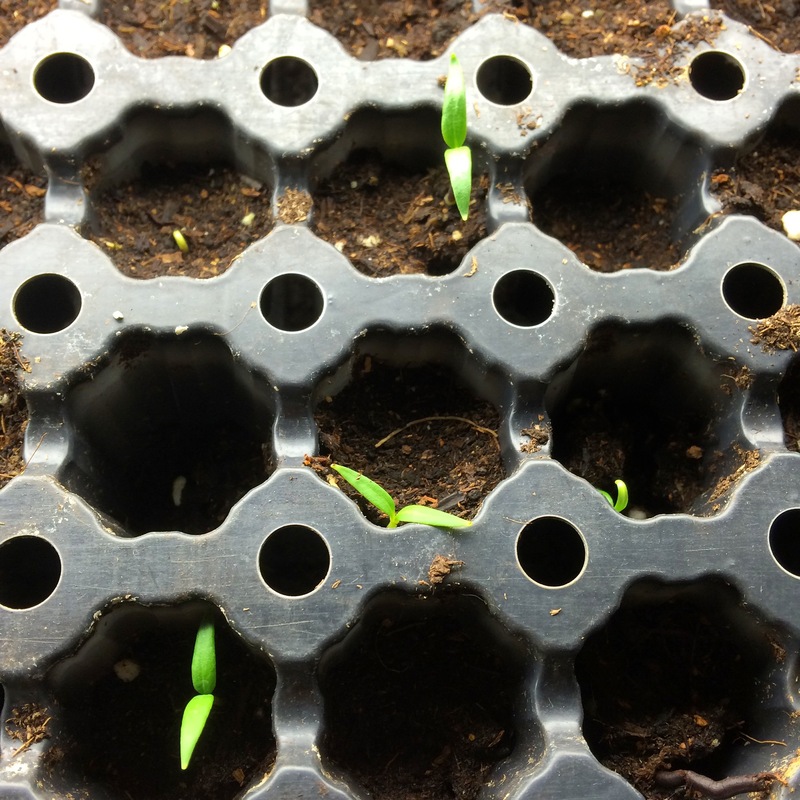 Last year it took the seeds almost a month to germinate in our less-than-tropical house. The sweet pepper seedlings I put in the ground were embarrassingly small compared to those hotties from the garden centre. This year, I did some research into pepper growing so I had a few germination tricks up my sleeve. 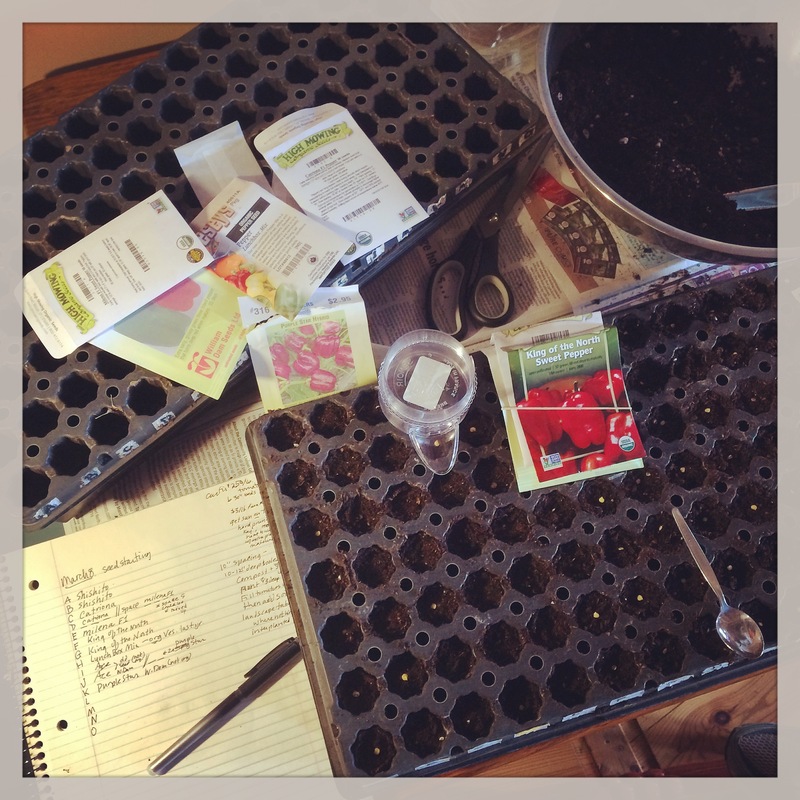 First, I started the seeds two weeks earlier than last year. Then, whenever I watered, I used warm water instead of cold. Finally, I set the black tray near the patio door on sunny days to heat up the soil. All was going well until one sunny day about a week after I seeded the peppers. There was a squirrel on the deck which our German shepherd spied through the glass. She was so beside herself with that mix of exuberance and murder that dogs have for squirrels, she knocked over the seedling tray. Soil, seeds and bad words flew in the air and landed on the floor. My carefully labelled seed cells were a mix of empty, half empty, untouched and overly full. There was also a fair bit of soil on the floor which probably contained seed; expensive, organic specialty seed. There was nothing to do but try to to salvage what I could. I took photos like a crime scene photographer, thinking it might help identify anything that germinated. Then I also drew a sketch of the seed tray with symbols to represent “full,” “empty” and “partially full.” Probably that was a coping mechanism to deal with my loss. Then a funny thing happened. The seeds germinated. Learning that seed trays and dogs do not mix. Somehow, these peppers managed to germinate despite going for an unplanned flight and losing a large amount of seed mix. Despite their rough start, they grew. To encourage them, I found a more secure “hot spot” for the tray and set it there for a few hours whenever there was a sunny day. The rest of the time, the little seedlings were under grow lights. I watered them lightly two to three times a day and checked them neurotically for any minor differences that could give me a clue as to their different types. They were virtually identical. Eight little seedlings popped up out of the soil I swept off the floor and placed in an old salad container. I am not sure what they are, but I know all of the peppers I started are sweet, not hot. Just not sure which ones are going to ripen to red, yellow or orange. Originally, I thought I’d sell half of the pepper plants to interested gardeners. Now, I’m not so sure. 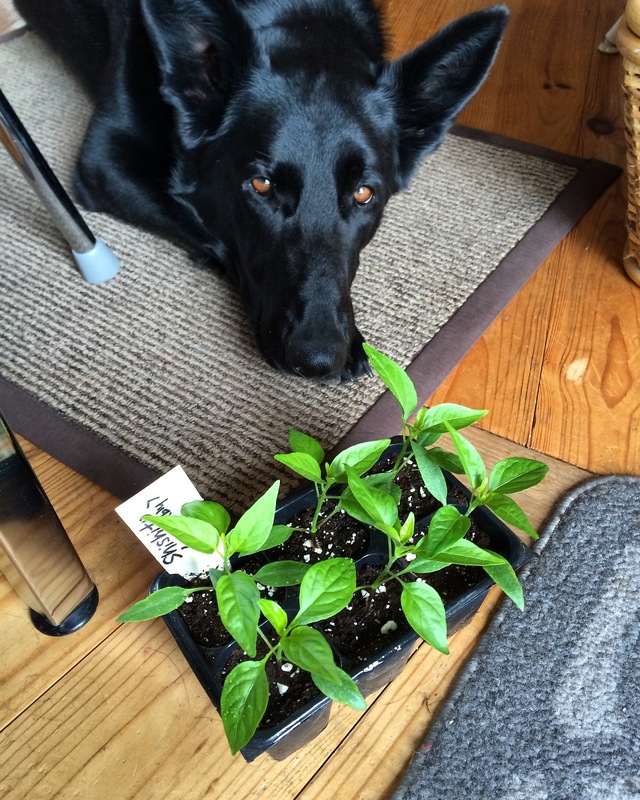 Would you buy a “mystery pepper” plant? Yes, she was finally forgiven. I’m fairly certain these are shishito pepper seedlings. We’ll find out in about three months. Frustrating experience but interesting story. There is always something to learn. Especially when Cricket is around! Previous PostPrevious Chickens in the hoop house, finally!